Sweet Corn Soup with Peaches is a twist on a classic corn chowder and is a perfect soup for summer since it can be enjoyed hot or cold! When I saw corn on this month’s Mystery Dish ingredient list I was SO excited because this Indiana girl loves her corn! If you’ve ever been to central or northern Indiana, you may have heard the jingle: “there’s more than corn in Indiana, it’s the best part of Americana, and it’s right within your reach… it’s Indiana Beach! !” [on beautiful Lake Shafer, Monticello, Indiana… proving once again there’s more than corn in Indiana.] C’mon, I’m sure you guys all have commercials/jingles memorized. Hearing that song was always a sign that summer was coming because Indiana Beach, a local amusement park, was opening. I haven’t been to Indiana Beach in years, but every time I think about corn, Indiana Beach pops into my head too. Successful marketing? I think so! But that’s not where we’re going today. 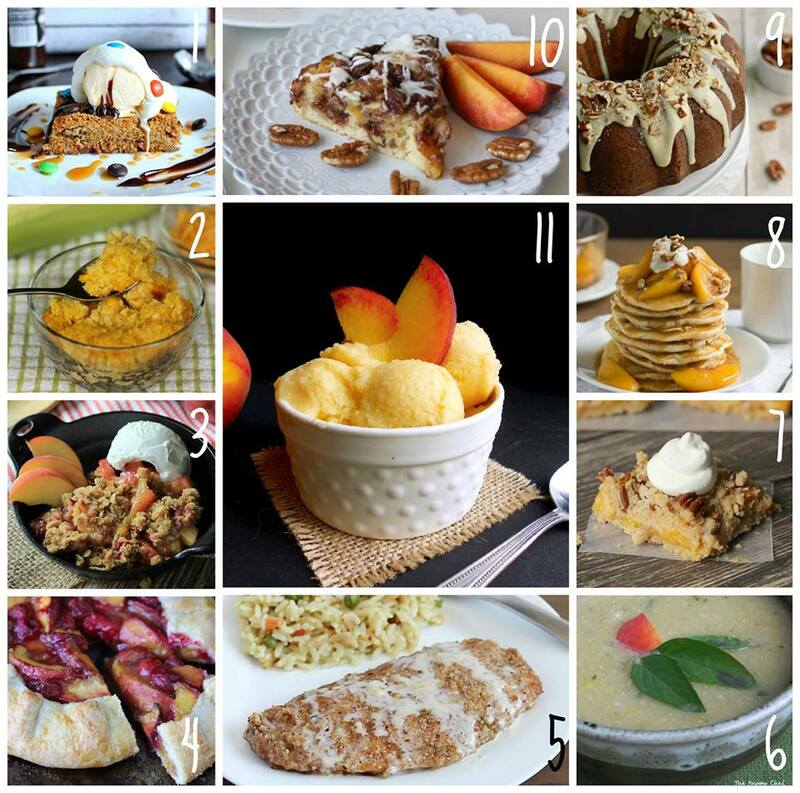 Meriam of Culinary Couture is this month’s hostess for Mystery Dish, and her list of ingredients for us to work with included: peaches, cheddar cheese, green beans, corn, chicken, nectarines, butter, pecans, heavy cream, pesto, and coconut milk/cream. We were supposed to use three ingredients. At first, I wanted to make something with peaches and cheddar cheese! You know me… I like to try interesting flavor combinations. But then I decided that might be a little too odd, even for me. 🙂 So I did what I usually do: consulted my good friend Mr. Google. An obvious thought I had was making some kind of salad with peaches, nectarines, corn, and green beans. An even more obvious thought was baking! 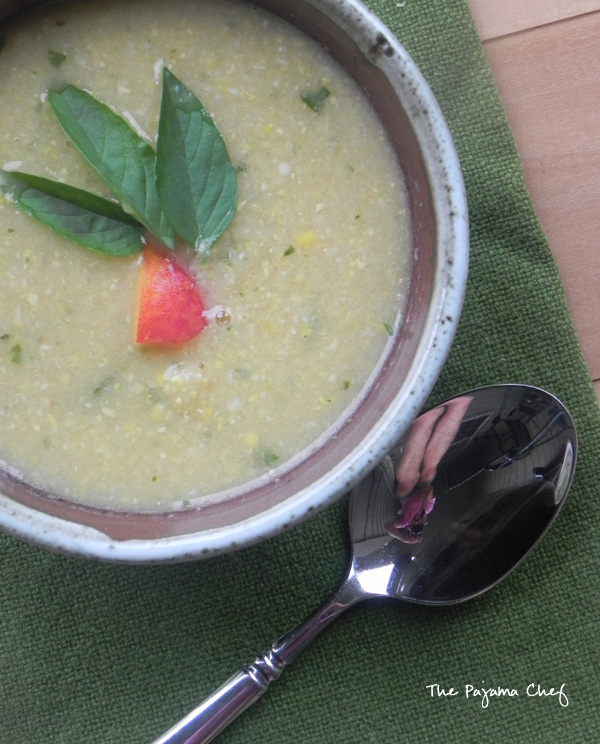 But somehow I landed on this soup: a twist on corn chowder using peaches, corn, and coconut milk off the list. And it was fabulous! 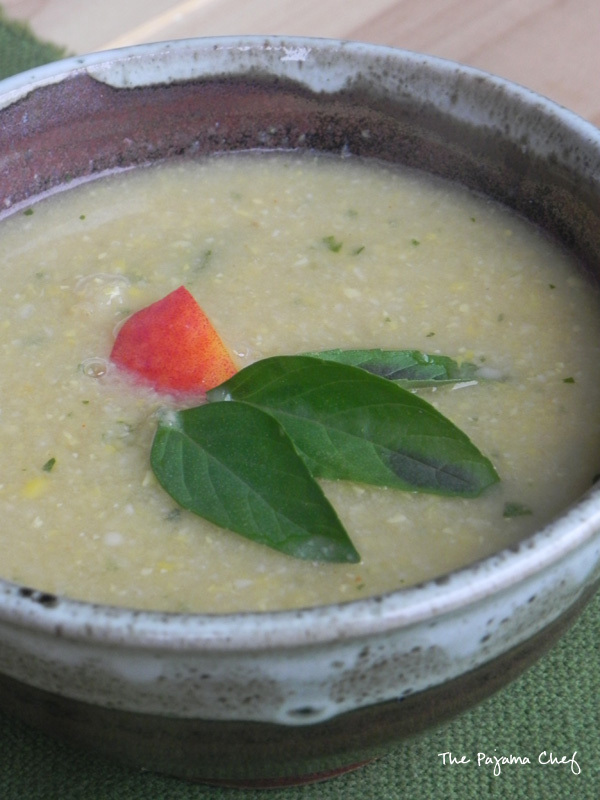 I’ve made a Mexican Corn Soup before, but this version is different. It’s a sweet soup. There’s no sugar or sweetener of any kind added, but there is plenty of sweetness from the corn [and the cobs that cook in the soup for a bit], peaches, and coconut milk. I know that sounds a bit odd, but it just works! It’s a taste of summer in a bowl, and you can serve it hot or cold depending on your preference. This is a great soup to enjoy for a light meal with a side salad and some cornbread, or it could be an awesome first course to serve with some bbq + fixings. I hope you enjoy this unique soup! Cut kernels from corn cobs and place both kernels and cobs in a large soup pot. Add broth, onion, garlic, cayenne, and 2 cups water and stir together. Add two thirds of the peaches to the pot too, and bring to a boil. Reduce heat to a simmer and cook, uncovered, for 30 minutes. Then, use tongs to remove corn cobs from soup pot and discard. Add coconut milk and Thai basil. Using an immersion blender, blend soup until smooth. [A blender or food processor can also be used but you may want to let it cool first.] Simmer for another 5 minutes or until hot. Garnish with remaining chopped peaches and chopped Thai basil. Check out what the other Mystery Dish girls made this month! “Mystery Dish” sounds like such a fun idea to use those ingredients. I have a monthly “mystery ingredient” post, but its nothing like this – so fun! 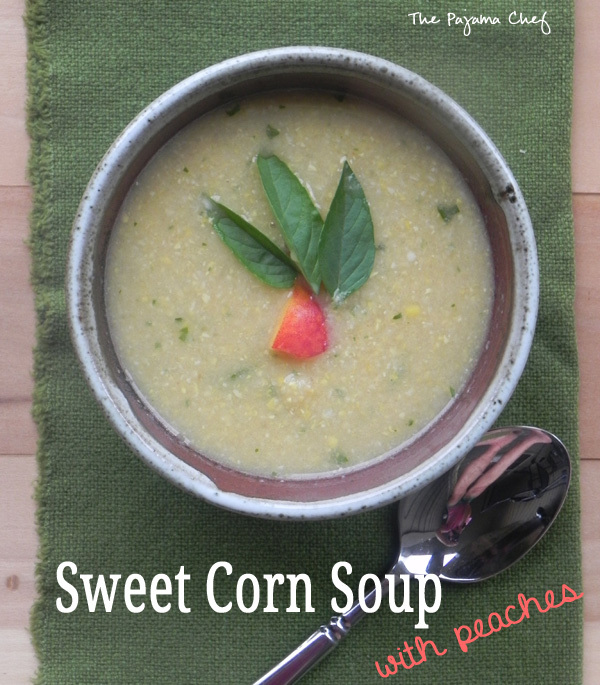 Love your soup combo of sweet corn and peaches with coconut milk – sounds delish! It is very fun- I’ll have to check out that feature on your blog. 🙂 Thanks!